This isn’t the way it usually goes. Boston University and Boston College weren’t slated to play each other in the first round of the Beanpot, so naturally they’d meet in the championship game. Not this time, though. The Huskies of Northeastern University, for so long the epitome of underdogs, showed up on the first Monday of February amid much media hype and crushed BC with opportunistic scoring and stellar goaltending from Brad Thiessen. And when BU and NU meet in the championship game, the classic rivalry will be missing, but a new one is ready to be ignited. 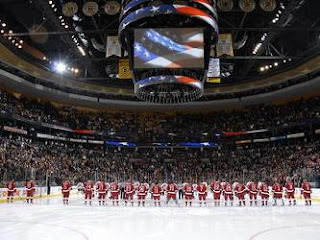 The fans of Northeastern, who call themselves the “Dog House” (in contrast to BU’s own Dog Pound), have maintained for years that BU is their biggest rival. The feeling hasn’t been mutual though, as NU has not been a threat to BU and BC’s co-dominance of Boston’s collegiate hockey since the 1980s. Now with head coach Greg Cronin finally bringing success back into the equation on Huntington Avenue, the Huskies are a team to fear, and an old rivalry is just waiting to explode. For each team's players, local bragging rights are on the line. If they don’t love to hate each other yet, they probably will after the first 20 minutes. Yes, this is going to be almost as much a grudge match on the ice as it will be in the balconies. A week ago, the Dog Pound and the Dog House found themselves uncomfortably close to one another. The fans from Northeastern took pride in their perpetual annoyance of the BU contingent during the first semifinal whilst Harvard had the upper hand, while the Dog Pound had no such luxury as they saw their numbers fall in sync with BC goaltender John Muse’s save percentage and the game became less entertaining for third party observers. No doubt there will be no such trouble in this Monday’s matchup, as the fans will show up in greater numbers than ever.